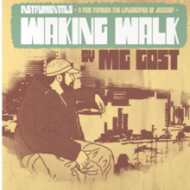 This is the Instrumental version of ‘Waking Walk’, the debut LP from MG Gost. Featuring 2 bonus remixes, courtesy of Dirty Hairy and Slone.All orders will receive a digital download card that will be inserted into the vinyl sleeve.For those who don’t know about MG Gost, he is an extremely talented producer/musician residing in Novi Sad, Serbia. A member of the well respected ‘Hain Teny’ collective, MG Gost is always creating that dope ‘ish.